Rajput wedding rituals are mainly known for their grandeur and ambience. They are being followed strictly since the times of Kings and Queens and each has a significance of their own. Rajputs are very fond of drinking and royal sweet dishes, hence it is common to find a variety of sweets made of malaai, dry fruits and ghee in Rajput wedding along with selection of beers and wines. 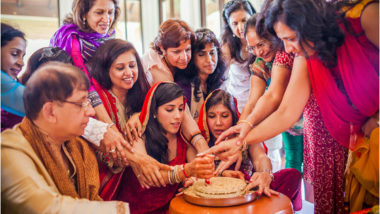 This is the beginning of the wedding rituals in Rajput marriage. The male members from bride’s house visit the groom’s place along with presents such as a sword, sweets, clothes, gold, etc. the bride’s brother applies tilak on groom’s forehead as a gesture of welcome into the family. An idol of Ganpati is installed in the respective houses of the groom and bride. It is worshipped every day until the wedding is solemnised. This is just another name for the haldi ceremony. Turmeric paste is applied on palms, forehead, shoulder and feet of bride and groom at their respective houses. Family, friends and close relatives gather at the houses, sing, and dance. Snacks and sweets are served. The maternal uncle of the bride presents jewellery and clothes to groom’s family. This gesture emphasises the fact that maternal uncles are also supposed to lend a hand in the marriage expenses. This involves the groom wearing a saffron scarf and performing certain yagnas in the presence of a pundit. This ritual has Vedic significance. The groom’s family presents the bride with a trousseau full of clothes and jewellery as a gesture of welcome. The Rajput baarat’s only include the men and no women. 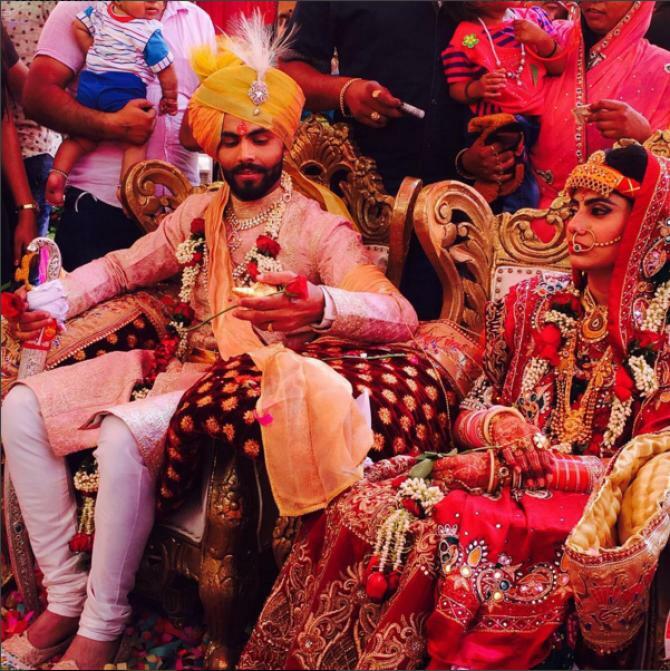 The groom dressed up in traditional Rajput attire and wears Gold ornaments, rides a horse or an elephant to the venue of the wedding. The circumnutating of the bride and groom around the holy fire seven times holding (tied) hands followed by the chanting of Vedic verses and taking of the wedding vows. The exchanging of garlands between the bride and the groom as in any normal Hindu Wedding. This means that the father of the bride donates her to the groom as a gesture of daan. This ritual has a Vedic significance, which can be traced back to the times of Ramayana and Mahabharata. The farewell of the bride. She leaves for her new house, showered with husks of rice and flowers for good luck. The welcoming of the bride into the groom’s house by knocking down a Kalashfull of rice grains. She is supposed to put her right foot as her first step into the house. The bride is made to meet the groom’s family. She touches the feet of all the elders in the house as a gesture of respect and they, in turn, present her with gifts or money as a gesture of blessings. The grand reception is held at the groom’s end. The after-wedding party in the honour of the wife where all distant family and friends gather for dinner and to drink and dance to celebrate. 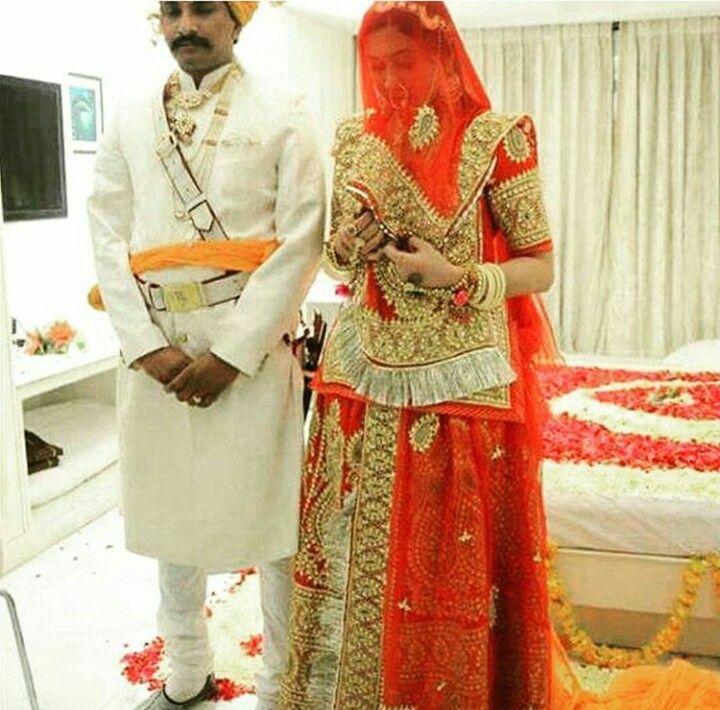 One particular detail to be noticed about Rajput weddings is that Rajputs still believe in the Purdah Pratha or the veil system. Hence, the women of the house, especially the bride remain under the veil in the presence of the men of family during all ceremonies and at all times. It is said that the veil represents that the women are reminded stay in their Maryada (humility) by doing this.